First you notice the color, then you notice the fragrance when you visit the gardens surrounding the home of Barbara and Howard Sperry on Ashland Ave. in Niagara Falls. Sometimes Barbara likes to shake the lavender and other plants to better enjoy the aroma. The Sperrys shared their garden, along with many gardening tips, during the Historic Niagara Falls Garden Walk on Saturday, July 16. 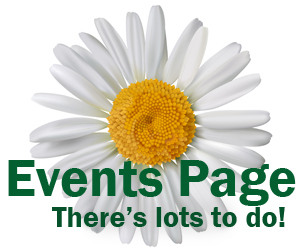 The event was presented by the Main Street Business and Professionals Association. 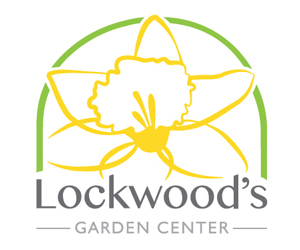 Arts in the Park, a multi-art celebration with gardening-related activities, was held in Schoellkopf Park the same day. Barbara starts many of her plants, including tomatoes, from seed. Starting tomatoes from seed is something many gardeners feel is too difficult to do without a greenhouse, but Barbara doesn’t even use grow lights. When you’re eating a tomato and find one that’s especially delicious, scoop out some of the seeds. Wash the seeds in a colander. Put the seeds in a Mason jar with just enough water to cover them. Close the lid tightly. Shake the jar every so often to prevent the seeds from floating to the top. Mold will form on the seeds, which is what you want. “That’s a Kentucky thing,” Barbara said. She often spent time with relatives there in hollers where there was no TV, so there was plenty of time to learn about growing plants. The Sperrys have many spots from which to enjoy their gardens. 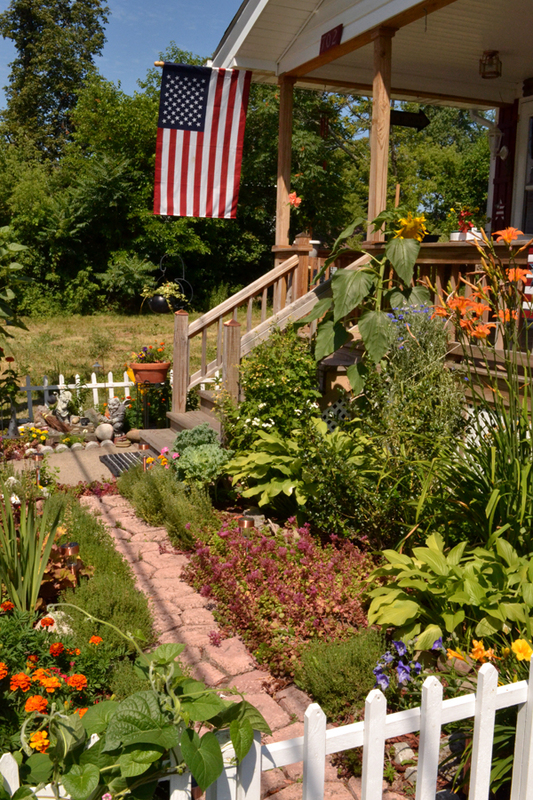 The front porch, seen in the first photo, offers a view of the lovely garden that takes up the entire front yard. The Sperrys’ backyard is long and narrow. 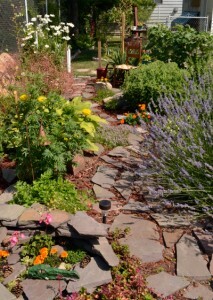 In the photo above right, you can see the wonderful path through the garden full of vegetables, herbs and flowers. Beyond it is a grassy lawn with a swing, which in early summer is covered with wisteria blooms. Another lovely spot is above left, amidst the flowers. 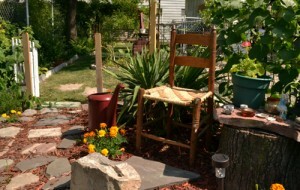 The table beside the chair is a tree stump topped with a stone slab. Barbara spends enough time weeding the garden that her pointer finger on her right hand gets stained. Here’s another of her tips: use a toothbrush to scrub the stain off. 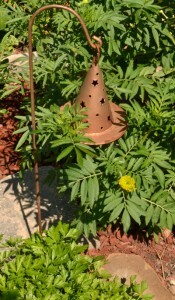 Displayed throughout the garden are witches’ hats, such as the one at right, and other garden decorations with a witch theme. Barbara uses them to express her religious beliefs– she’s Wiccan. She hesitated before explaining the significance of her ornaments because not everyone understands her beliefs. “We’re very nice people– we really are!” she said. Hers is a very peaceful and nature-loving religion, with its major teaching being “harm none,” she explained. It also has a belief, similar to karma, that what you do, positive or negative, will come back to you. Scattered throughout the garden are small plastic animals that are placed there for a a very practical purpose– to scare away the rabbits. Barbara says the rabbits seem to be afraid of the toys and stay clear of her garden. 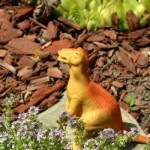 Above left, a dinosaur guards the territory between some purple alyssum and sedum. 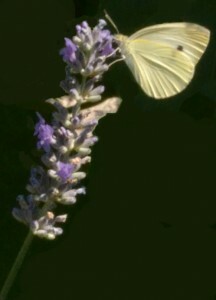 Other visitors to the garden, such as bees and the butterfly on the lavender at right, are more welcome. Barbara loves sitting in the garden with the bees buzzing around and the smell of the dirt rising up to her. “I don’t know how anyone couldn’t love it,” she said.